"Nervousness, teeth-grinding; ADD in adults, insomnia; anxiety, stress, stress-related indigestion or gastritis; postpartum depression (mild), times of transition, such as menopause, moving, job loss, empty nest; seasonal affective disorder (mild), heartache due to grief or loss; nervous animals or those who have experienced recent traumas," from Rosita Arvigo's Ethnobotany of Belize. This herb helps reduce the feeling of stress. It calms anxiety and even reduces insomnia if taken directly before sleep. *It can be used as needed by all ages over 1 just in smaller doses Not to be used in conjunction with anti-depressants. 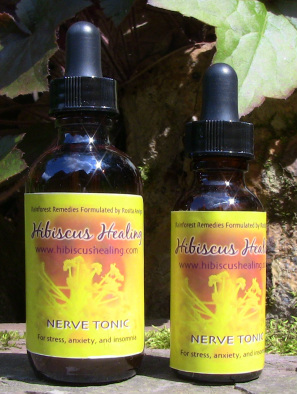 To learn so much more about the Nerve Tonic and its many uses check out this Blog Post, How to Get A Good Night Sleep.